I had my alarm set for 4:30 yesterday morning to be sure I was awake in time to see the wedding of Prince William and Kate Middleton. There are so many opinions of the wedding and all aspects of it. As for me, I thought it was perfect. While the wedding was taking place on the other side of the world, the sun was rising outside my window. For me, optimism is two lovers walking into the sunset arm in arm. 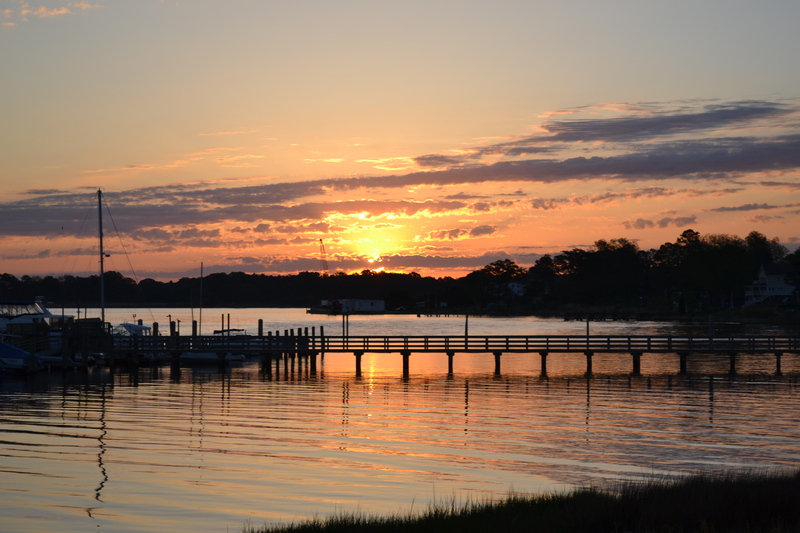 Or maybe into the sunrise – whatever appeals to you. Last month, I wrote a little poem entitled “The Hope of a Shelter Kitty” for one of Mama Kat’s Writing Workshops. If you missed it, and you’d like to read it, click here. I pledged to donate $1 per comment left on that post by my readers. 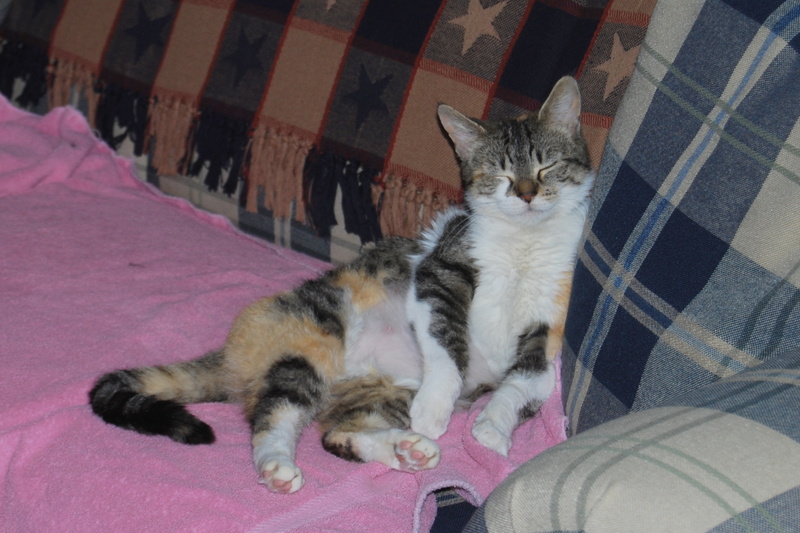 The recipient of my donation was the humane society where we had recently adopted our kitty, Sundae. That post resulted in 28 comments, but I wrote a check for $35 to the society, which is the fee to adopt a pet. 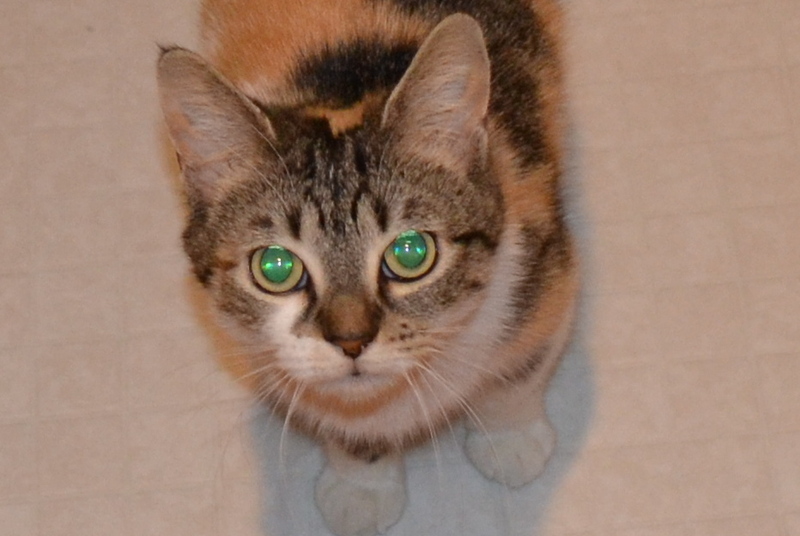 This week I received a thank-you letter from the humane society, letting me know that my our donation paid for one of Sundae’s former shelter-mates, a kitty named Ida, to recently be adopted to a wonderful home. So Ida, Sundae, and I say “meow, meow, thank you”. I was toying with the idea of making another pledge to benefit our local animal shelter. (Sundae was adopted from one about an hour away.) My readership has increased in the past few weeks, so if I were, perhaps offering to pledge $1 for each comment to today’s post, I could be in serious trouble. Couldn’t I? Couldn’t I? So it probably wouldn’t be in my best interest to make that offer. But it WOULD be in the best interest of the animal shelter. Can YOU refuse that face? 4.) Photo Story: Take a walk through your neighborhood this week and share some pictures of what spring looks like where you live. I take a walk in my neighborhood almost every morning, but I fudged a bit on this prompt and took photos in my own yard. This is how my spring day unfolded. 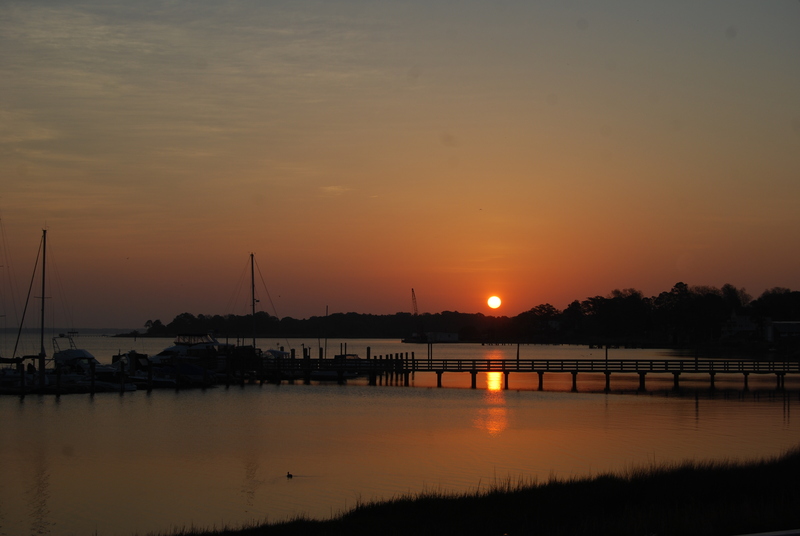 It began with an awesome orange sunrise. 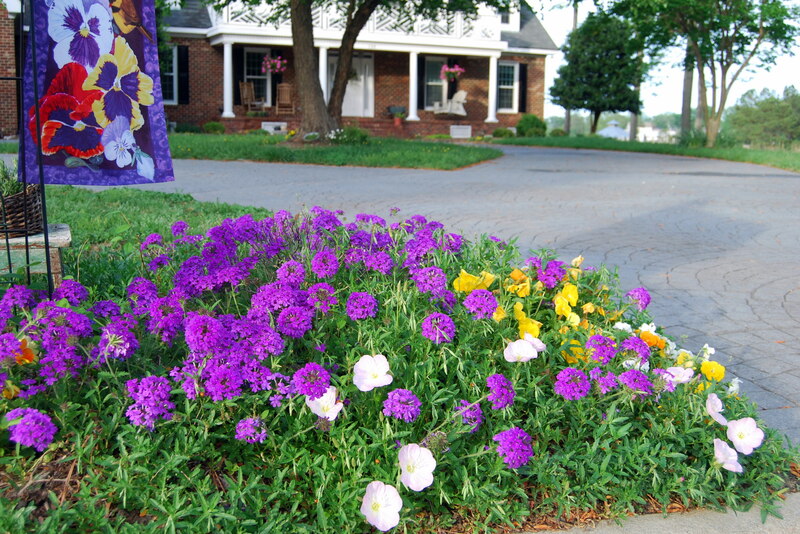 As I was heading out for my morning walk, I noticed the primrose is blooming in the flowerbed by the driveway. I’m loving these flowers right now. The verbena has come back this year in full force, and the temperatures haven’t gotten warm enough yet to kill the pansies. 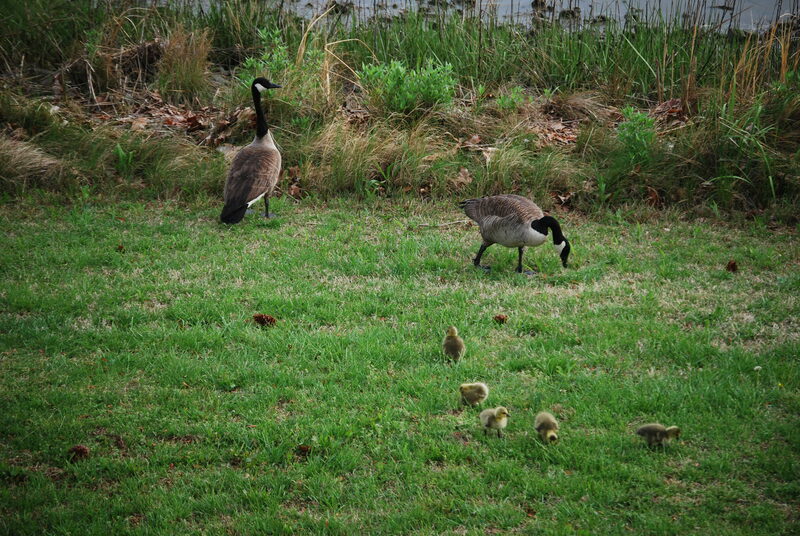 Later in the day, Motor Man sees a pair of Canadian Geese and their little ones out in the yard. It’s the first time we’ve seen goslings this year. Every spring, it seems that the babies disappear. The parents keep a watchful eye on them, but the predators somehow manage to get to them. Maybe the youngsters will fare better this spring. 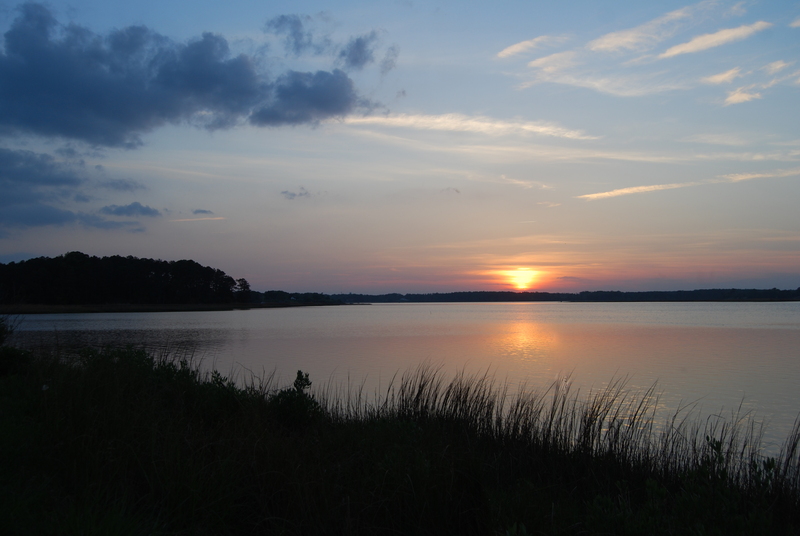 The day ends with a peaceful spring sunset. So how is spring coming along in your neighborhood? For those of you who are gardeners, don’t you just love to discover pleasant surprises in your yard? Maybe an unexpected bloom? Or a plant that you thought was “gone forever” is suddenly thriving? Several years ago, I bought a whitewashed iron trellis to place on our deck in front of the chimney. 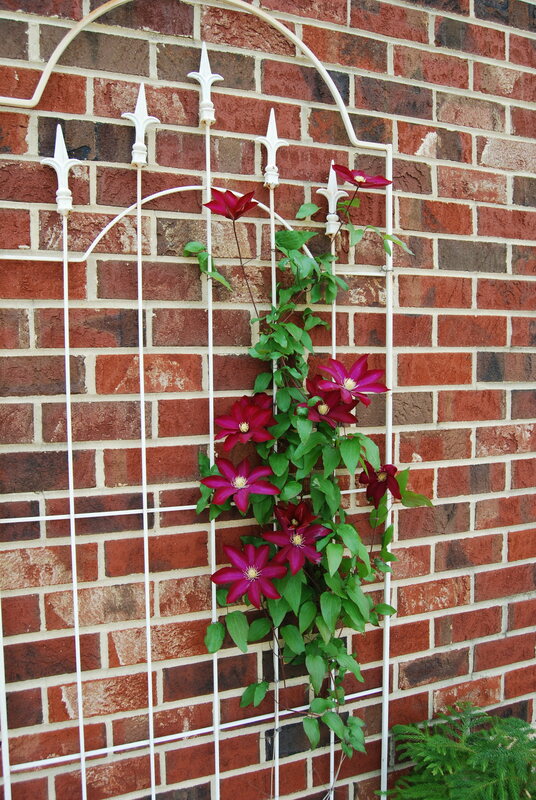 And I bought a clematis to grow on the trellis. 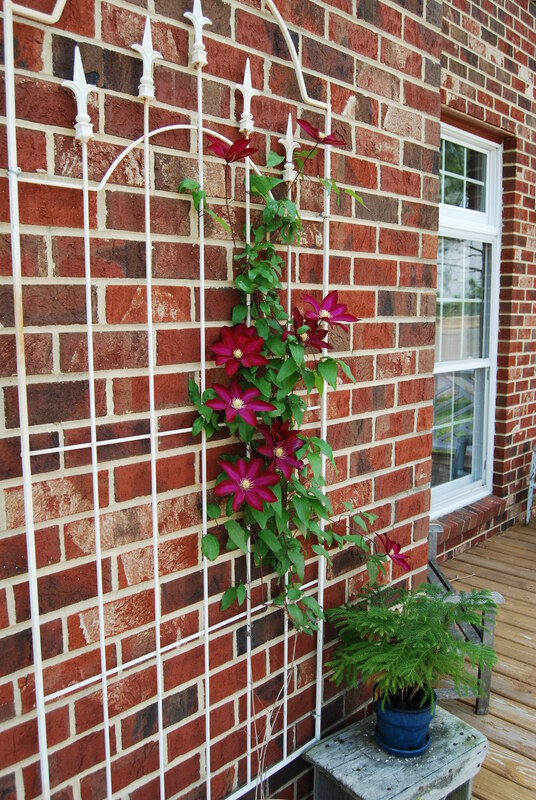 I’ve never had any luck with clematis; I think this one may have bloomed for a short while the first year. And since then it really hasn’t been impressive, meaning it was done after having one or two flowers at the beginning of spring. Saturday I was in the yard putting down mothballs to deter the bunnies and deer from some of my plants, and I glanced up at the deck. This was the jawdropping moment. I would love to think this will be covered in blooms all summer, like my neighbor’s clematis, but I think I know better. 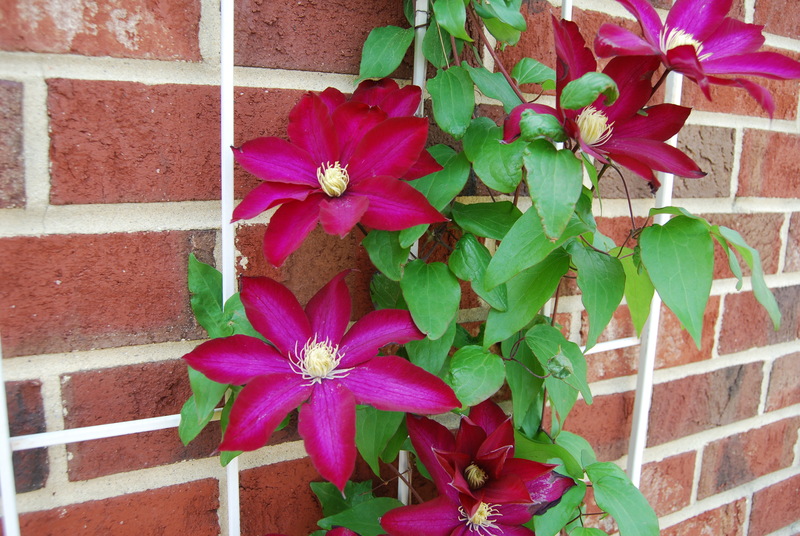 But here’s what is even more surprising than finding these blooms: the clematis I planted was white. 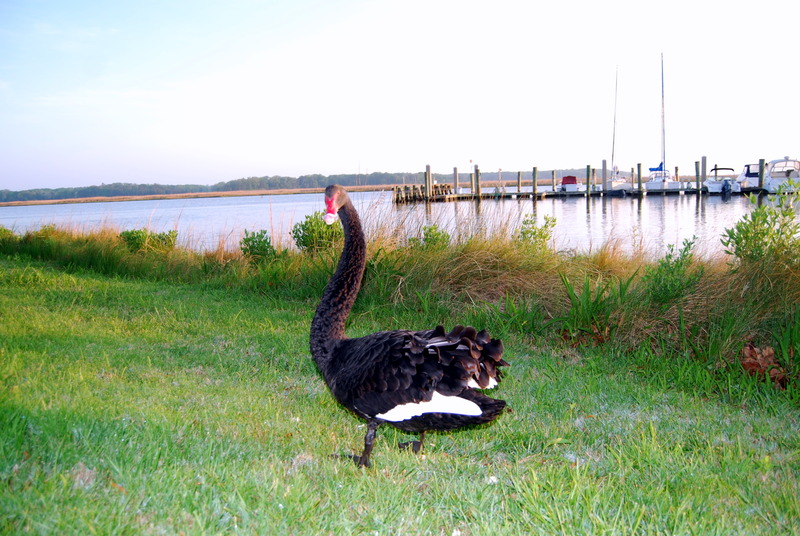 If you’re new to my blog, let me fill you in on our swans. They aren’t really ours, but they visit quite often. Usually they visit as a pair: a black one and a white one, although we do see them separately. We began calling them Groom Swan and Bride Swan when they graced us with their presence during a wedding on our lawn a couple of years ago. Unplanned, but a nice touch. Whenever I see them, I rush out to toss bread in the water for them. 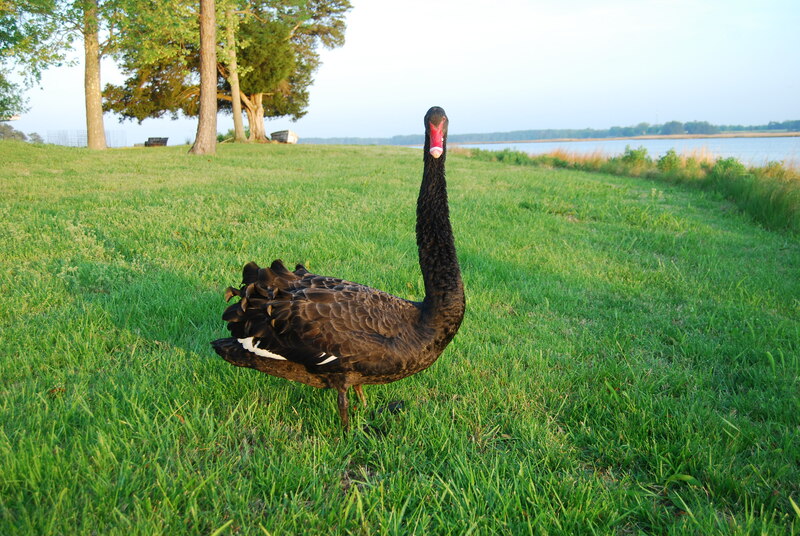 Groom Swan has a little greeting when he sees me: he stretches his neck out really long and he sort of “honks”. I think it’s a swan hello. One day I’m hoping to get that on video, and if I do, you know I’ll share. 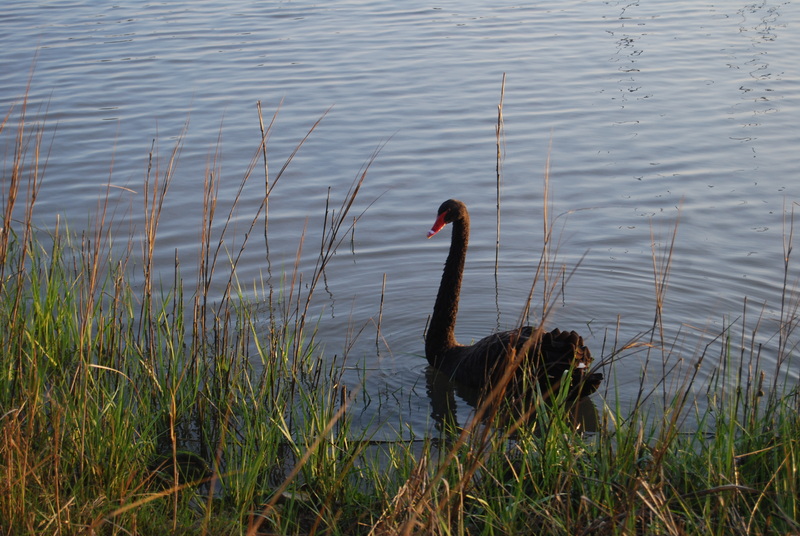 Yesterday morning, just after sunrise, I saw Groom Swan, and went out with some bread. He immediately started plodding through the marsh grass into our yard. Out of the water, he seems so much larger. He has done that once or twice before, but it doesn’t happen often. 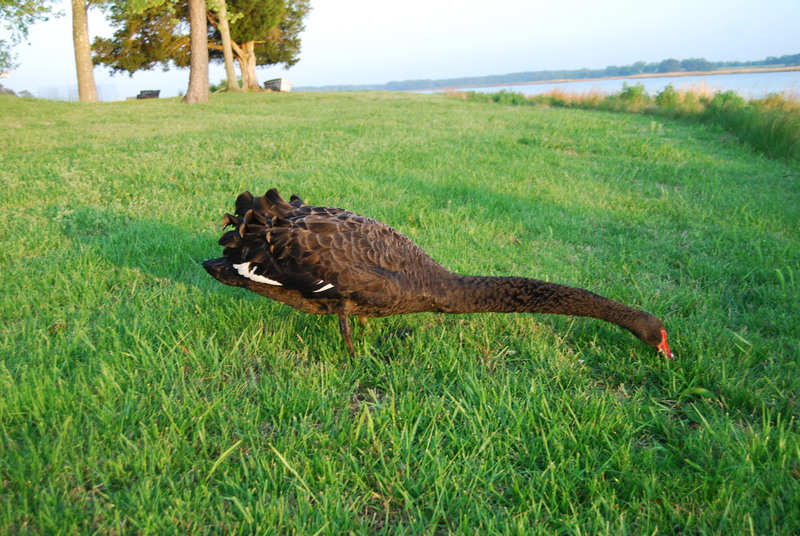 He has difficulty eating bread when he’s on land, and ends up with blades of grass in his beak. And flossing isn’t an option. I intentionally threw bread a little distance from him, so you could see how far he stretches his neck. When the bread was gone, he started waddling back to the water, but turned around to glance at me over his…… oh, never mind. Then he was back in the water. He seems much more at home there. And there’s no need for dental floss. Although the first Late Model race at our local track was scheduled for April 9, rain ended that race after only a few laps. So we had our first official race of the season this Saturday night. 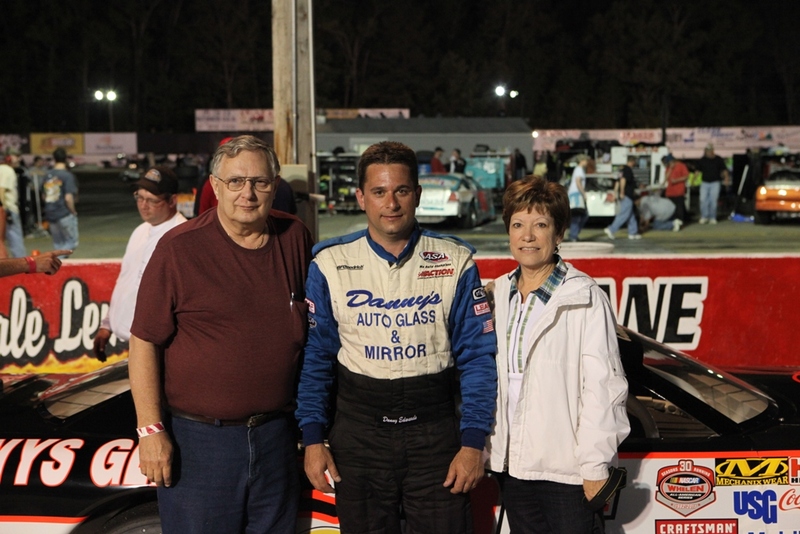 Late Model is the featured division at our track, and Motor Man builds engines for several of those drivers. He also builds engines in the lower divisions, but that’s a post for another day. 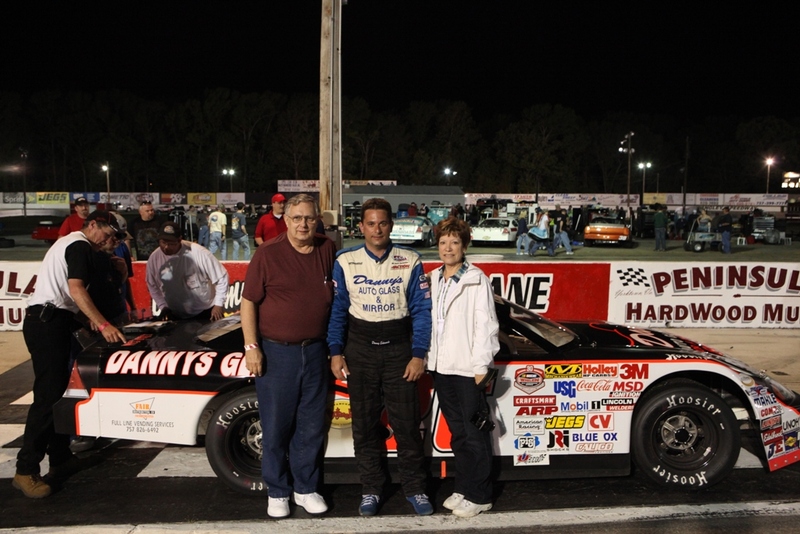 One of the Late Model drivers, Danny, won back-to-back track championships a few years ago with engines built by my hubby. He also holds the track record for fastest qualifying time. And Danny started this season off right with a win Saturday night. Victory Lane is a great place to be on race night. The hours of work on the car, Danny’s talent, and luck all came together for the win. And when Danny was interviewed following the race, he thanked his sponsors and his crew. And then he thanked his “motor man”. My Motor Man. *Thanks to the track photographer, “Picyer Photos”, for allowing me to use these pictures. Not only is today Easter Sunday, but it’s also the birthday of a very special cousin of mine. Not only are we cousins, but we have been close friends longer than we can remember. When this picture was taken, we’d been friends for years. That’s Lona on the left. Our family relationship is rather unique. Lona’s dad and my mom were siblings. 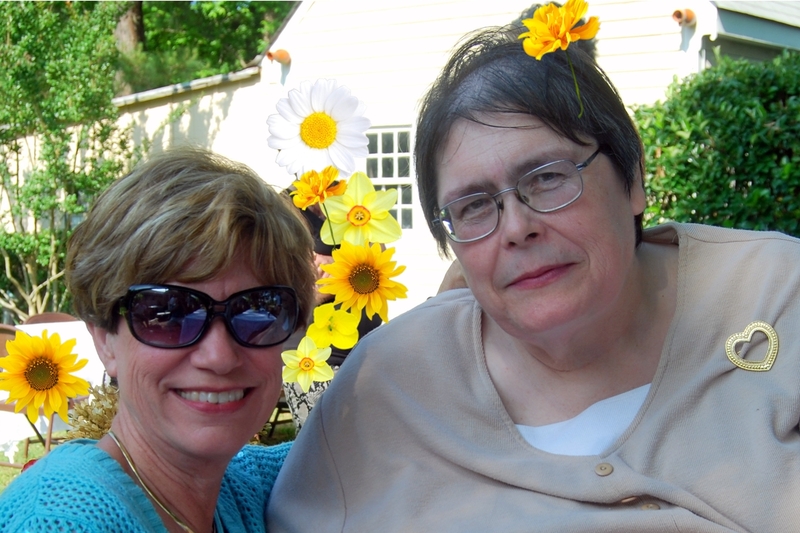 And Lona’s maternal grandmother and my dad were siblings. This photo of us was taken a little more recently. The background was somewhat distracting, with people, chairs, etc., so I “grew” some flowers. Just pretend that we’re sitting in a garden, okay? Happy Birthday, Lona! Hope it’s as special as you are to me.